Alright, Roanoke, we need to talk for a second about a restaurant that changed my view of the entire city. Remember all the kvetching I’ve done about how there isn’t a decent falafel to be found here? You know how it’s pretty much all I ever dream of finding in the Star city—a street-style falafel with fresh, golden fried falafels, smooth hummus with a hint of sumac and olive oil, a pepper paste that’s warm, but not overpowering? By god I’ve found it. And it’s a dive. And it’s out of the way. And, I swear, if this restaurant closes because no one knows about it, I will not forgive you, Roanoke. So I’m going to do my best to convince you that it is the #1 restaurant you need to visit. As in tonight. The restaurant will even make it easy on you—it’s open 7 days a week from 11 am – 10 pm. So really, you have no excuse not to go, it’s made it easy for you. So what is this place? Jerusalem Restaurant #2. There isn’t a #1; the name is a technicality from a legal dispute with a partner who bought out or left the restaurant or something like that. And the name won’t be around for very long, apparently they’re changing it after the new year to attract more patrons. I’m pro that since ‘Jerusalem’ is a little politically charged. It’s located on Williamson Road right near Hershberger. A not-so-great location if there ever was one. And even though parking stretches around the back of the building, you’d never know it unless you knew it. So now you do—no excuse. Light on ambiance, I’m ok with it. Plenty of booths and tables, though we were the only lunch patrons today (Saturday). We were told they do a hefty take-out lunch business, but let’s get more people in the doors. It’s a shame for such a big restaurant to go to waste. With a menu vacillating between Mediterranean and Italian, we were surprised at how heavy on the Italian flavors it was, but, once again, after the new year, they’re looking at adding more Mediterranean specialties, possibly with an emphasis on vegetarian/vegan. I can’t comment on the Italian dishes right now, but I can guarantee I’ll be back—and I can’t wait to try out the pizza after our hummus and pita experience. 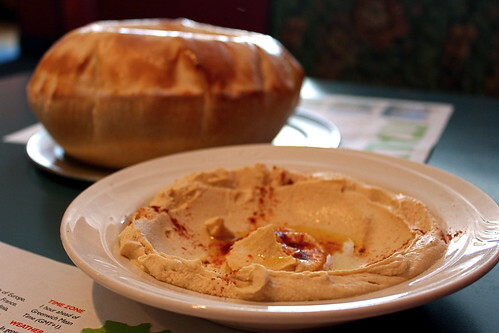 After a quick glance at the Yelp comments, I have one thing to say: don’t listen to any of the reviewers who mentioned that the hummus/pita isn’t any good. Do you see that pita? Fresh out of the oven. When I began to rip the dome open, steam gushed out (making it a little dangerous, but who doesn’t like to flirt with burns? )—that fresh. And the hummus was almost the best I’ve had (certainly the best in Roanoke). Creamy with olive oil and sumac as garnishes, it was bright and smooth—exactly what I want from hummus. As for the sandwiches, G’s gyro was, and I quote from G, “the best I’ve ever eaten.” G’s eaten his fair share of gyros too, trust me. The meat (halal quality) was slightly spicy and lean and sliced thin. Topped with tzatziki, lettuce, and tomato and wrapped in flat bread, the sandwich was undeniably exquisite. We both loved that while the tzatziki was rich and thick (fantastic on its own), it didn’t smother the meat which was the star of the sandwich. The other sandwich’s star? The falafel. My sandwich was stuffed with freshly fried falafels layered with tzatziki, hummus, harissa (or some sort of hot pepper relish), lettuce, and tomato. Wrapped in the same flat bread as the gyro, it was hands down one of the best falafels I’ve ever eaten (Paris, you’ve still won that game) and, by far, the best falafel I’ve found in Roanoke. 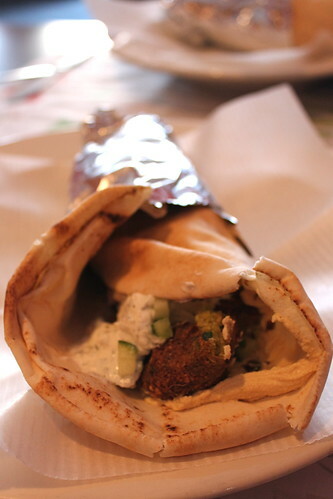 Like the gyro, the toppings didn’t overwhelm the falafel and the flat bread held it all together perfectly. You have to understand, this is one of the best meals I’ve eaten in Roanoke in a long time. For all the comments of slow service, our meal was served fairly quickly (maybe a 10-15 minute wait for the hummus—well worth it for that freshly baked pita) and the service was impeccable. Our server was cheerful and friendly, but not overbearing, and she was quick to serve us our drinks and the check. I wonder if some of the early comments on the restaurant reflect the initial ownership/partnership of the restaurant and not necessarily the current situation. The current owner, I think, is Neadal Kanan, and I believe he is manning the kitchen these days, not the Tunisian chef/owner, Fathi Jadid. Whatever the case, G & I have zero complaints about the service or the food—both were fantastic. We’re looking forward to visiting soon and trying the pizza (because, seriously, with pita like that, how could the crust not be phenomenal? ), and maybe some of the other Italian dishes, but I have to admit, the possible expansion of the Mediterranean menu is what excites me. That and the thought of more vegetarian/vegan friendly dishes. There are plenty of underserved vegans and vegetarians in the valley, I’d love to see a restaurant pick up the slack. So I have I convinced you yet? 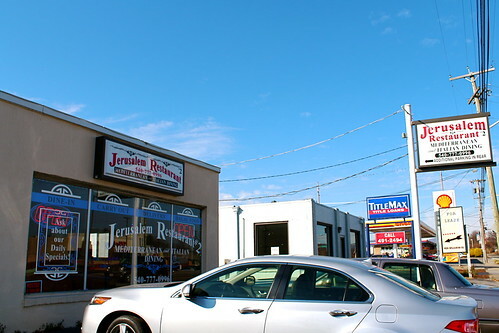 Are you ready to hit the road and find Jerusalem Restaurant #2? Because if you aren’t, I haven’t done my job. Yay! Aren’t the tiny little hole in the wall restaurants wedged between tire specialists and construction supply stores always the best? Signs point to yes. Exactly! I’ve decided I need to explore that corner of town a little more to see what I’m missing. Awesome! I’ve never been served a pita still puffed and blisteringly hot like that, even when I made them in my own home. What a gem of a find! My pita never turns out that lovely–but I’m going to have to try and try again! Yes! Yes, I’m ready to eat there! and I don’t even live anywhere near Roanoke. I was wondering what that puffy looking thing was. 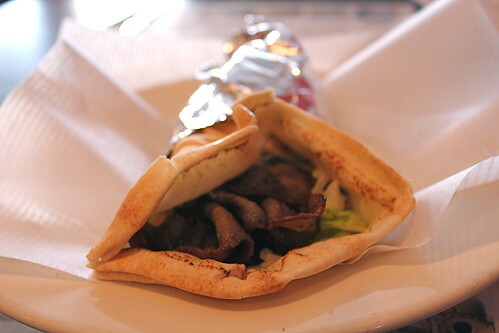 That is one amazingly pita! I need to find a better recipe than the one I have–mine are always so heavy. Internet, I need help! Oh man, I miss Falafel King next to Emory on a weekly basis–their falafels are freakin’ amazing. I never found out if their stellar spicy sauce you can add to it is vegan (I went with the don’t ask don’t tell policy when I was a vegan) but their sandwiches were bar none my fave. Have you ever tried it? Mediterranean Grill was pretty good too–loved their side of potatoes.